Can the surface of a tiny moon help to explain the mysterious geography of Mars? In an Electric Universe, the charged moons and the charged rings around Saturn are alternately repelling and attracting each other as they move through the gas giant’s plasma sheath. Electric discharges from Saturn might be what created its rings and moons in the first place, so electricity is most likely responsible for their appearance and arrangement. The recently renamed Cassini-Solstice mission, launched from Cape Canaveral on October 15, 1997, has found electromagnetic fields extending from Saturn to most of its moons. Tethys and Dione are both known to be interacting with Saturn’s electric field, ejecting “great streams of particles into space,” according to NASA officials. The Saturnian system is not a neutral environment, it is highly charged and electrically active. Many features, particularly in the ring structure, cannot easily be explained. “Spokes” hovering above the ring plane, bands that are sorted by chemical composition, as well as the X-rays that the rings emit, falsify standard explanations. At some point in the past, according to Electric Universe theory, Saturn underwent a violent spasm that unleashed plasma discharges throughout the Solar System. Any celestial bodies within range would have been blasted by powerful currents, intense radiation, and heat from electromagnetic induction. All of that energy might have also assisted in creating the distinctive patterns seen on Saturn’s moon Helene. 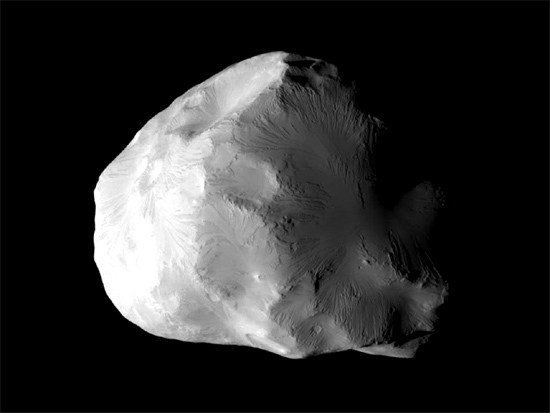 Helene is a small moon, measuring 36 by 32 by 30 kilometers. 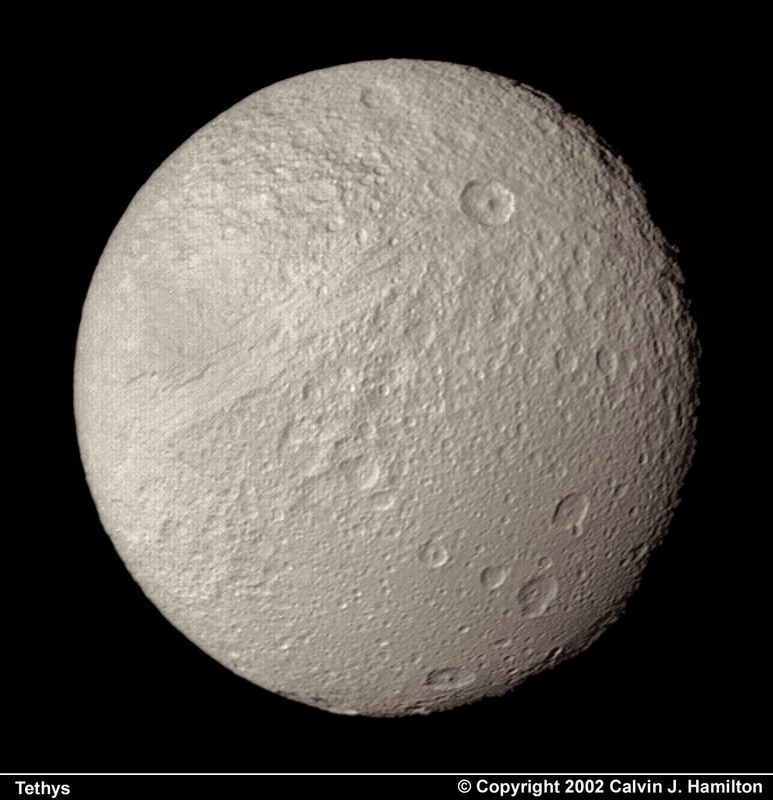 Named for Helen of Troy, it is referred to as a Trojan satellite of Saturn because it resides in the Dione/Saturn Lagrange point: it is in the same orbit, but precedes Dione by about 60 degrees. Helene joins a grouping of other small Solar System bodies whose surfaces exhibit craters and gouges so large that it looks like they should have been blown to pieces. How they withstood such catastrophic impacts is still a mystery to planetary scientists. One surprising feature shown in the image at the top of the page is the narrow “gullies” that appear to be flowing down the sides of large craters and horseshoe-shaped valleys. Helene is so small, however, with an escape velocity of only 33 kilometers per hour, that it is unlikely landslides of such magnitude can occur. Plasma discharges that pause for a moment before jumping away can excavate a crater. What is visible on Helene, as well as in the canyons and valleys of Mars, is what remains after electromagnetic fields grip and pull charged particles out of the surrounding terrain. Electrons were yanked toward the center of a lightning discharge channel of tremendous power that ripped apart the rocks, dragging along neutral material. Microscopic dust was sucked up into the plasma vortex and ejected into space. This explains why the bottoms of many craters on Helene and Mars are smooth and flat, with little or no blast debris, yet the surface of Helene is covered with finely divided powder, and the southern hemisphere on Mars is covered with dust and debris. A plasma lightning stroke on the surface of a planet or moon might leave behind Lichtenberg trackways that point to where the electric current flow was strongest, excavating the material like a rotating auger of fire. It is those effects that are most likely responsible for the large crater anomalies, dendritic channels and ridges (Lichtenberg figures), and the ultra-fine dust on Helene, as well as for the “avalanche” channels on Mars.